Grenoble, Age-friendly City, is a city designed for all ages where everyone must have the opportunity to move serenely on the public space alongside other generations. By joining the Francophone Network of Age-Friendly Cities in February 2016, the City of Grenoble wished to become involved in a project aimed at improving the well-being of seniors on its territory. This requires the deployment of a coherent gerontological policy adapted to the needs of the Grenoble territory, its sectors and neighborhoods. 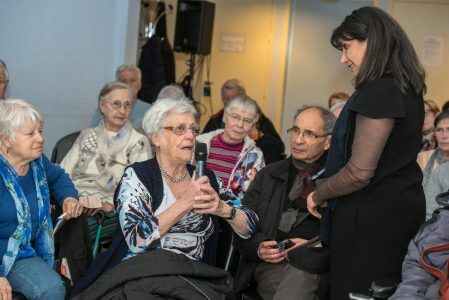 The gerontological policy promoted by the City of Grenoble is available locally through the action of the PAGI (Gerontological and Intergenerational Animation Centers), which focuses on the prevention and development of citizenship. This requires the deployment of a gerontological policy attentive to the most fragile and throughout the life course. This support is embodied through the joint action of the City of Grenoble and its CCAS, in a transversal and complementary way: the social watch ensured among others by the service of Home Restoration (RAD) and the file of the fragile persons; taking home care with the Home Care Service (SSIAD); reception in residential accommodation with the Residences autonomies and the EHPAD; support for people suffering from Alzheimer’s disease and their caregivers with Denise Belot’s Caregivers’ Home, the Alzheimer’s Specialized Home Care Team (ESA) and the Les Alpins Day Care Center, real resource centers. This involves deploying a gerontological policy coordinated with the local associative dynamics. This requires the deployment of a gerontological policy that is articulated with other delegations in a logic of transversality. The “Age-Friendly City” initiative is a great tool at the service of the transversality of all municipal policies, and not only social policies. This transversality is embodied through its links with the CCAS Strategic Plan, the Municipal Health Plan or the Strategic Plan for residential care facilities for older people of CCAS Grenoble. This means prioritizing intergenerationality wherever possible and desired.